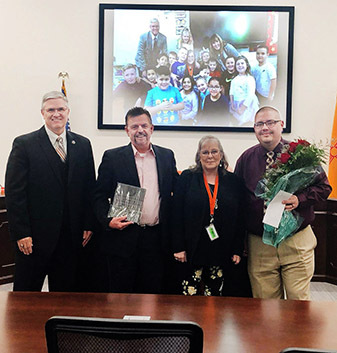 The Artesia Public Schools’ current superintendent of personnel and student services, John Ross Null, has been named the new superintendent of the district and will begin his tenure July 1. APS Superintendent Dr. Crit Caton announced his retirement in December, and the Board of Education held two closed meetings this year – the first Jan. 7 to review applications submitted by Null, Thad Phipps, APS superintendent of operations, and Cody Skinner, Park Junior High School principal, and the second Jan. 8 to interview the applicants. During its regularly scheduled meeting Monday, the board offered the position to Null, with his salary to be negotiated at a later date. The board voted unanimously to hire Null. “It truly is an honor,” Null said. “I want to say that Mr. Phipps and Mr. Skinner and the passion that they have for the kids in this district and the commitment that they have for the kids in this district is unbelievable, and there is absolutely no doubt that this district would excel under the leadership of either one of them. I have the utmost respect for both of you, and I can’t wait to continue working with you. Along those lines, I am also glad that Dr. Caton is here for another six months to continue to work with us as well. 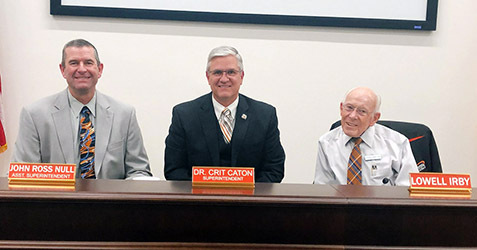 In other business, Null presented the board with the first draft of the 2019-20 district calendar, and superintendent of instruction and federal programs Danny Parker received the board’s permission to renew the district’s service contract with PowerSchool Student Information Services in the amount of $45,020.48. Phipps received the board’s approval to purchase 30 new theatre-type seats on a three-tiered deck for the Bulldog Pit team room from AK Sales in the amount of $31,147.25. Funds will come from the HB33 account. Shonda Poe, second-grade teacher at Central Elementary School, was announced as the Tate Branch Success Maker award recipient for the month of December. Poe received a plaque, bouquet of flowers, and check from Tate Branch Auto Group. Caton also announced the retirements of Wilma Brannon, APS cafeteria worker; himself as APS superintendent; Tina Holleman, education diagnostician, SPED; and Debra Leonard, music teacher for the elementary schools. The resignation of Amanda Torrez, SPED instructional assistant, Roselawn Elementary School, was announced, along with the employment of Maribel Flores, third-grade teacher, Central Elementary; Taylor Shoeffel, instructional assistant, Grand Heights Early Childhood Center; Desirae Thurman, kindergarten teacher, Grand Heights; and Angie Wolf, language arts teacher, Zia Intermediate School. At the conclusion of the meeting, the floor was opened to public comment, with recent Artesia transplant Joseph Howell addressing the board. Howell stated he and his wife like the education system in Artesia so much she took a job as a special education teacher at Park Junior High. He alleged there exists “some serious dilapidation” at some of the schools in the district. Howell said he and his wife donated their time and materials to painting her classroom, as she was told she would need to create a “welcoming environment” for the students. “I think that you might want to think about where you are spending your money, I mean, a thousand dollars per chair when you haven’t even got money to put into painting the special education rooms or replacing some carpet that has been there since the 1970s, you might want to consider that,” Howell said. Park principal Skinner says it’s true administration asked teachers this year to strive to create classroom environments that would invigorate their students but that how those environments were created was up to the teachers. Skinner says some teachers chose painting their rooms a different color as part of their individual process. APS maintenance staff could not be tasked with the painting, as the rooms were not yet in need of routine maintenance. Paint, however, was purchased by the school and made available to those teachers who wished to use it. Howell also told the board some schools “have a tradition” of using daytime sporting events as fundraising opportunities. The practice, commonly known as a “buy-out,” allows students to donate a small sum to a charitable cause or school organization in order to leave class and watch a basketball game or other sporting event. Artesia High School recently held a buy-out fundraiser during the City of Champions Classic basketball tournament, with funds raised going to aid a local family at Christmastime. AHS principal Eric Greer said at Monday’s meeting that all students given the opportunity attended. “Wonderful idea, happily donated money to that, what’s wrong with it is requiring students to do it or else punishing; that’s against the law and is immoral,” Howell said. “I ask that you change that tradition, encourage the students to give, make it an opportunity to where they can donate on their own, don’t require it. The APS Athletic Department confirmed today that students not wishing to participate in buy-outs are not told they will be sent to In-School Suspension (ISS). Rather, they are told they have the option of attending study hall instead, which is held in the same room as ISS. Students are aware the study hall option is entirely up to them based simply on whether or not they want to attend the game. Students wanting to attend who may not have the money to donate are still allowed to attend, and no threat of punishment is issued either way. The next regularly scheduled meeting of the board of education will be held at 6 p.m. Monday, Feb. 11, in the Lowell M. Irby Board Room at the Administration Building.